The HP 10500 Switch Series is a next-generation modular enterprise campus core switch designed to enable the evolving needs of a cloud-connected and rich-media-capable infrastructure. It sets a benchmark for performance, reliability, and scalability with next-generation Clos architecture with 3-microsecond latency, delivering ultra-high 1/10/40GbE port density and is 100GbE-ready. With HP Intelligent Resilient Fabric (IRF) technology, the HP 10500 Switch Series can be virtualized across four chassis with a single management interface—enabling flatter, more agile networks. The HP 10500 Switch Series provides a high speed fully distributed next generation Clos architecture with up to 11.52 Tb/s switching capacity and up to 13.72 Tb/s switching fabric capacity to meet the demands of bandwidth-intensive applications today and in the future. It is 100GbE ready with ultra-high 1/10/40GbE port density and 3-microsecond latency. 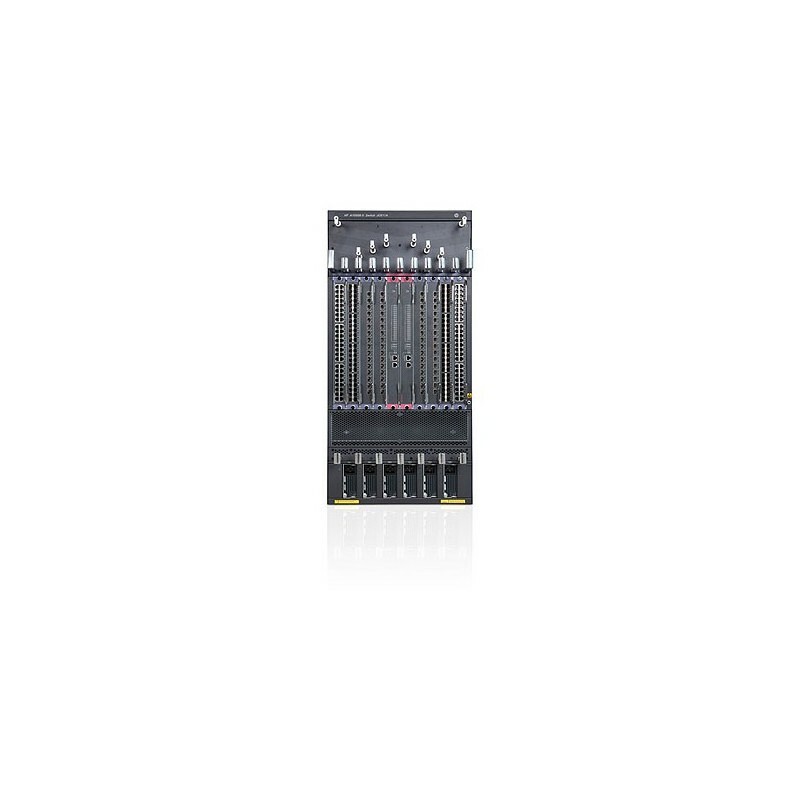 With up to 12 interface module slots, the 10500 Switch Series provides up to 96 ports 40GbE, 576 10GbE ports and 576 1GbE ports and allows you to optimize deployment with a choice of 4-, 8-, and 10-slot chassis. HP Intelligent Resilient Fabric (IRF) allows up to four 10500 Switch Series chassis to be virtualized into a single switching/routing fabric that can support more than 2,300 line-rate 10 Gigabit Ethernet ports or 192 line-rate 40 Gigabit ports. The 7500/10500 Unified Wired WLAN Module integrates with the 10500 switching fabric to deliver a single unified network for wired and wireless connectivity. The 20Gbps VPN firewall module provides advanced firewall features. No hidden costs with license-free software with advanced Layer 2 and 3 feature set including IPv6, MPLS functionality, and robust QoS. The HP 10500 Switch Series includes a high-speed fully distributed next-generation Clos architecture that simplifies large-scale switching architecture, reduces possible fault points, and provides greater defense capabilities. HP Comware 7, an advanced modular operating system, brings native high stability, independent process monitoring, and modular design to easily restart processes for seamless upgrades to individual software modules, enhancing serviceability and greater high-availability. Fast software upgrades without service interruptions for higher availability and zero packet loss with In-Service Software Upgrade (ISSU). Open application architecture enables fully-integrated high-performance application-specific modules. The HP 10500 Switch Series includes a robust set of security and quality of services features to build a trusted network that meets your ever-changing corporate policies and compliances. Flexible authentication options include 802.1X, MAC and Web Authentication, and Endpoint Admission Defense, providing you with greater security and policy-driven application authentication. Included with 10500 Series Switches are a powerful set of multilevel-access security controls, such as varying security management login, RADIUS, SSH, TACACS/TACACS+, to protect and control change management access. The HP 10500 Switch Series can be seamlessly managed with HP Intelligent Management Center (IMC) to provide end-to-end network transparency with consistent network experience through comprehensive configuration, compliance and policy management. Integrated security and unified wired and wireless networks.